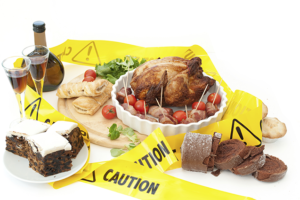 The Australian Food Safety Information Council, in partnership with Tonic Health Media, today launched their food safety tips for Christmas and the holiday period including a warning to consumers to be careful with raw and risky foods. Rachelle Williams, Council Chair, said the risk of food poisoning increases around Christmas time as we enjoy entertaining more and the weather gets warmer, which can cause food poisoning bacteria to grow quickly in many foods. ‘Christmas celebrations can be risky as they often include several generations of family including the very young, pregnant women, the elderly and those with poor immune systems who can become very ill if they do get food poisoning. Also you cater for larger numbers of people – putting a strain on your fridge and possibly creating a recipe for disaster at Christmas. Don’t cross-contaminate fresh or cooked food with raw meat or poultry. Carry them in separate shopping bags, use separate chopping boards and utensils, store cooked and fresh food covered and separate from raw food in the fridge. Avoid the undercooked turkey by making sure it is fully defrosted in the fridge or get your supplier to defrost it in their cool room. You might want to consider cooking something smaller like a turkey breast or other poultry. Don’t wash any poultry before cooking as that will spread the bacteria around your kitchen. Cook the turkey until a meat thermometer shows it has reached 75° C in the thickest part and cook any stuffing separately as it might not fully cook inside a whole turkey. Salads are perfect for our climate and healthy but keep them refrigerated and serve up just before you eat them, returning leftovers to the fridge. Cooked rice and pasta are also a food poisoning risk if not refrigerated, so don’t forget to refrigerate the pasta or rice salad. Seafood is also a great choice for Christmas and if it is cooked most common food poisoning bacteria and viruses will be killed; but there can be risks if you eat it raw, for example raw oysters or sashimi. Be careful and hygienic in preparing precooked prawns, bugs or crabs which can also be contaminated by your hands when they are peeled or shelled. Cooked egg dishes are also simple and nutritious but try to avoid raw or minimally cooked egg dishes, such as raw egg mayonnaise or fancy desserts, which can be a particular risk for food poisoning. ‘Finally, take some time over the holidays to do our Christmas Food Safety Quiz and learn a bit more about food safety,’ Ms Williams concluded. The Food Safety Information Council would particularly like to thank Tonic Health Media for their support. As Australia’s largest health & wellness network, our important food safety messages will be broadcast in 3500+ GP waiting rooms across the country, communicating with patients and their carers whilst they wait for health services see their website for more info.